ווי פילע פון ​​איר וויסן, איך האט ניט קאָכן פיל איידער איך געווארן וועגאַן. רובֿ פון מיין מילז זענען נעמען אויס אָדער געגעסן אויס. ווען איך האט קאָכן, מיין ווערסיע פון “כאָוממייד” ינוואַלווד אַ פּלאַץ פון באָקסעס און ענוואַלאָופּס. מיין וועדזשטאַבאַלז זענען די פאַרפרוירן טיפּ אַז געקומען מיט די ביסל פּאַקאַט פון סאָוס. My mashed potatoes came in an envelope; just add water. And my favorite thing, the rice, came in a box where I boiled the bag and added the sauce. ממם….cheesy rice with broccoli and by broccoli, I mean the little green specks that I suppose let them legally label it as containing a vegetable. A few weeks ago, I had a craving for that rice. יאָ, even after almost 5 years vegan, I still get cravings for the foods I used to eat. That’s ok. Cravings are ok, it’s what you do about them that matters. When I get a craving, I just make a vegan version of what I used to eat. 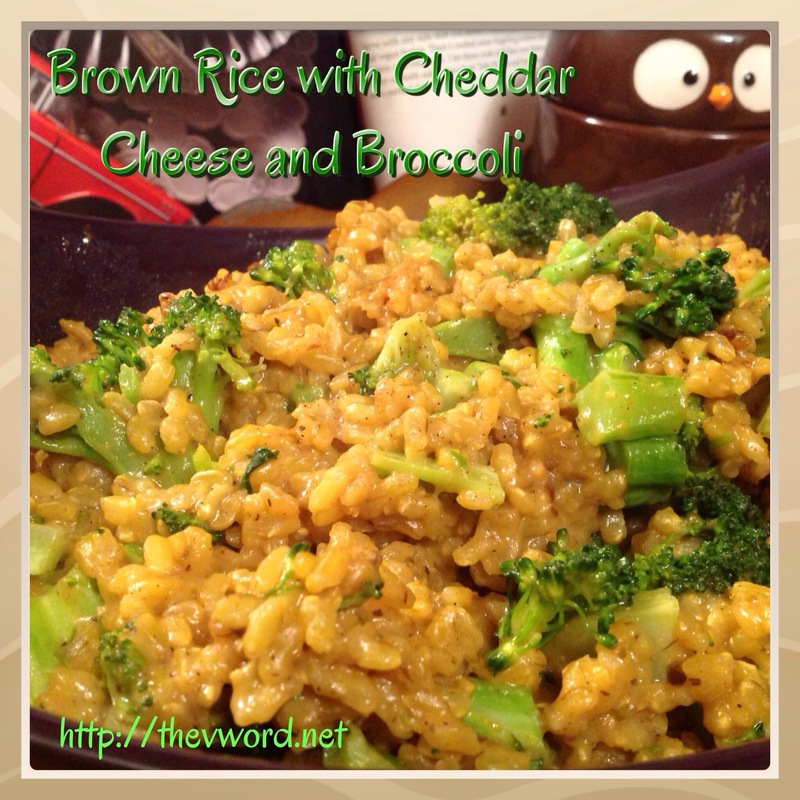 So I had to create my own version of cheesy rice with broccoli that would be vegan and much healthier than the old kind. This is really easy since making vegan cheese sauce is a snap…as long as you have a yummy vegan cheese. That’s where Vegan Gourmet comes in. וועגאַן גאָורמעט is from the Follow Your Heart company. You all know Follow Your Heart – they are the makers of Veganaise, probably everyone’s 1st vegan mayo and winner of VegNews 2013 Veggie Award for Readers’ Favorite Condiment (קאָנגראַץ!!!). They also make dressings, cream cheese, and specialty spreads. And vegan cheese shreds. 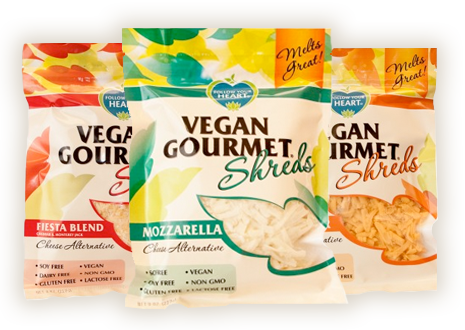 Vegan Gourmet Cheese Shreds come in Mozzarella, Cheddar and Fiesta Blend flavors. They are vegan, סוי פֿרייַ, gluten-free and non-GMO certified. That’s super-important. There are a lot of vegan cheeses out there but they don’t all melt that well. Vegan Gourmet Cheese Shreds melt beautifully and they have a real authentic taste. The Fiesta Blend tastes spicy and zesty, the Mozzarella is creamy and the Cheddar is tangy. 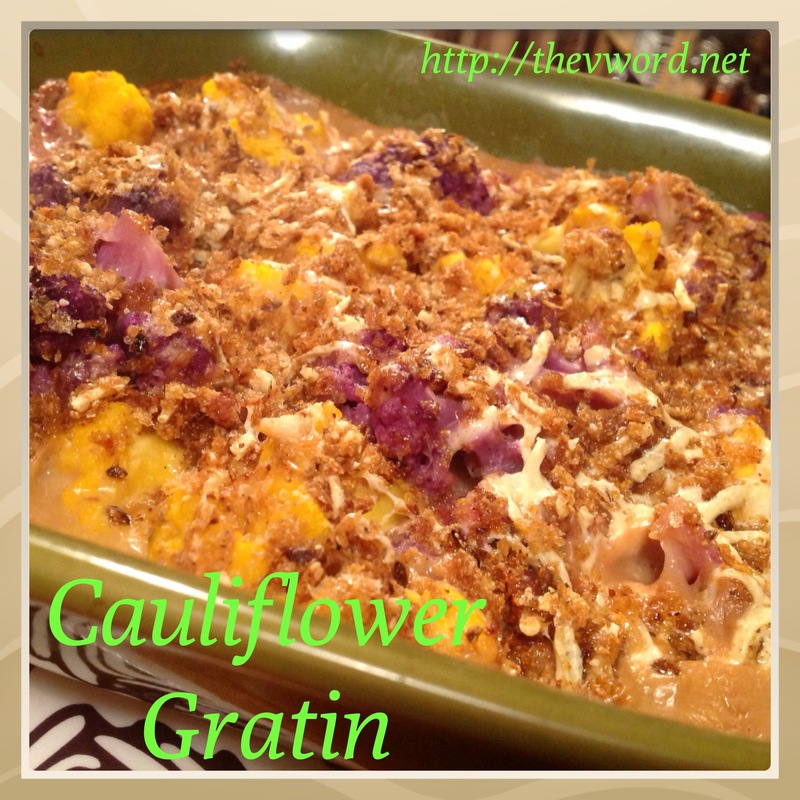 In addition to this recipe for cheesy rice, I used Vegan Gourmet Cheddar Shreds in my Cauliflower Cheddar Gratin that is in די “V” וואָרט קוקבוק: יום טוּב אַדישאַן. Back to the cheesy rice. It’s so simple to make. I just cooked up some brown rice, steamed a whole head of broccoli, florets and stems and made a delicious cheese sauce. It’s so quick and easy, no one should ever buy pre-made cheese sauce again. 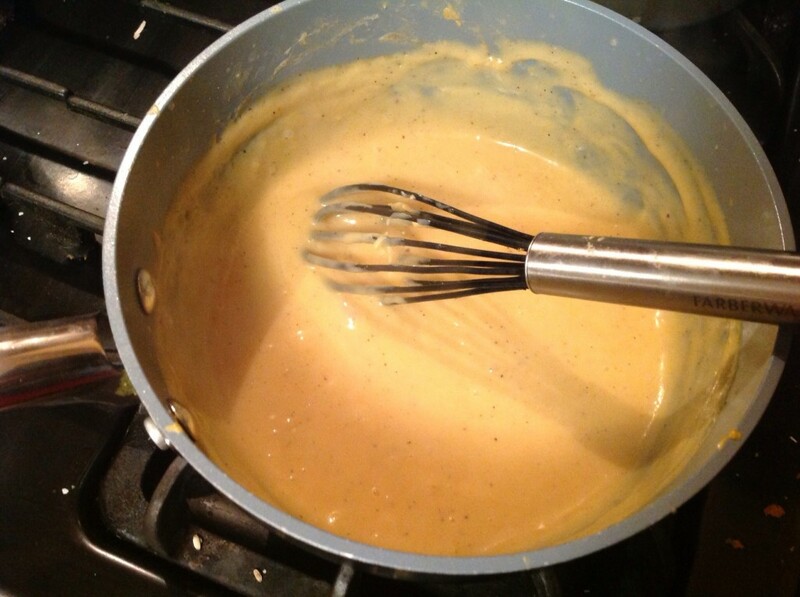 Just make a roux with flour and milk, melt in the cheese and add seasonings. אַז ס עס. Toss it all together and you have the most decadent, creamy and satisfying dish that will take you right back to your childhood…if you ate cheesy rice in your childhood. I didn’t so for me, it takes me back to those meals I considered homemade before I knew better. 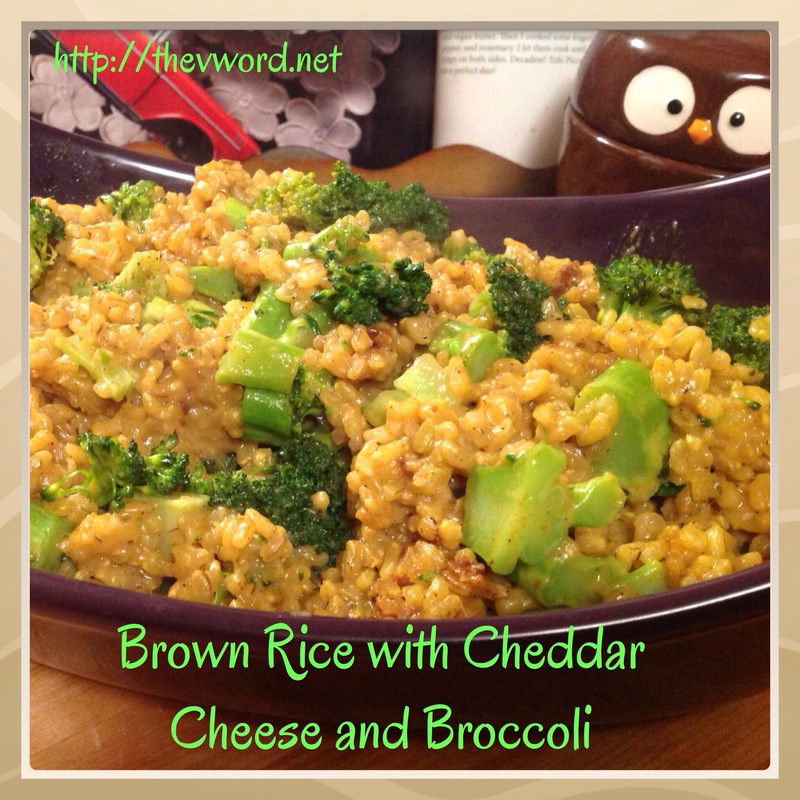 My Cheesy Rice with Broccoli is so amazing, it can be a side dish or the main dish. It’s because I can satisfy my cravings with delicious, cruelty-free options like this that I not only don’t fear my cravings, I welcome them. They lead me to be creative, resourceful and oh, so satisfied! האַנאָע האָבן! טשעק אויס די Follow Your Heart web site און “ווי” זיי אויף זייער פאַסעבאָאָק בלאַט. Heat the oil in a large saucepan over medium-high heat. Add the onion and a pinch of salt and cook for 3 מינוט ביז סאָפאַנד. Add the rice and cook for a couple of minutes until it looks chalky. לייג די וואַסער, stir and bring the water to a boil. Cover the pot, lower the heat to low and simmer for 30 מינוט אָדער ביז די וואַסער איז אַבזאָרבד. בשעת די רייַז איז קוקינג, cut the head of broccoli, both stem and florets, into bite-sized pieces. When you cut the stem, trim off the outermost layer which can be tough. 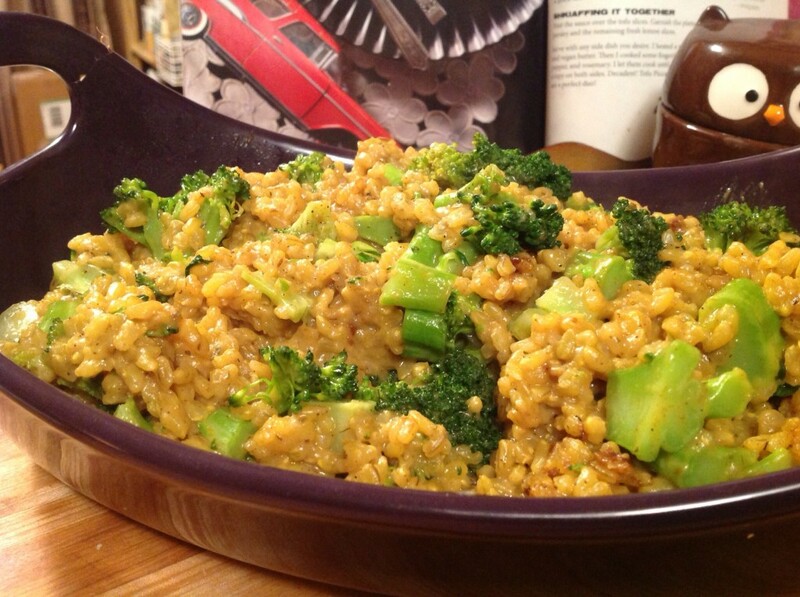 Two minutes before the water is absorbed, add the broccoli to the pot with the rice to steam. Then turn off the heat and let the rice and broccoli sit in the covered pot for 10 מינוט. Heat the butter in a medium-sized saucepan over medium-high heat. Add the flour and whisk until combined. Let the roux cook for 1 minute to get rid of the flour taste. Whisk in the milk and keep whisking until all of the roux is dissolved. Let it cook over medium heat. It will thicken a bit. Add salt and pepper to your taste as well as a pinch of nutmeg. Now you have a béchamel sauce. When the béchamel sauce is thicker and hot, turn off the heat and add the cheese. Stir to melt the cheese and then add the mustard. טעם פֿאַר געווירץ. Add the cheese sauce to the rice and broccoli. מישן געזונט צו פאַרבינדן. דינען בשעת הייס. יאָ, I’m on the same page. I don’t call myself a vegan. I have a cruelty free lifestyle. My cleaning, personal hygiene, and pet food (יאָ, pet food) is all cruelty free. If you’re wondering about experiments on lab animals for your pets food do your research on Iams!!! I was shocked too!!! Bonjour j’habite en France est ce possible de trouver ce fameux fauxmage ? De très belles recettes sur ce blog. Merci. Salut, vous pouvez consulter le localisateur de magasin sur le site web Vegan Gourmet ici http://followyourheart.com/store-locator Merci pour vos aimables paroles. This was beyond awesome. Kids absolutely devoured it. ריאַ, have you ever “cheated” (hate that word)? If so, how did you handle it? Cheated? קיין, not intentionally. I have had unintentional incidents. I once blogged about a doggie birthday cake I got Benny and didn’t realize it had yogurt in it. I once ate a salad at a restaurant and didn’t realize it had cheese in it. I once or twice missed an ingredient on a product and ended up consuming milk powder or honey, עטק. Even though those incidents were accidents, I was still left with a huge sense of guilt and a feeling of being contaminated. טאַקע, and anger when it was the restaurant’s fault since they knew our food was supposed to be vegan. My personality is such that if I do something once, I will do it again. It has to be all or nothing for me. That’s why I never cut class in high school until the very last day of school. I knew I’d do it again. When I first became vegetarian, I was very skeptical that I could do it. I loved meat. LOVED meat. But after watching “טרעפן דיין פלייש,” I couldn’t stand being a part of the suffering. My freezer was filled with chicken breasts because chicken cutlets were my favorite food. I had to get rid of them. Now when I cook, I taste. A lot. (I was hitting 300 לבס. for a reason). My class was having a goodbye party so I made the chicken cutlets. וועגן 40 of them. And I didn’t taste one while I made them and I didn’t taste one at the party. It was a very hard hurdle for me but I had to do it. If I had tasted one, I probably would have given up, thinking I couldn’t be meat-free. I know that I have no willpower when it comes to fattening foods. I can’t eat one or two chips, half an order of french fries. But I can eat none. I cheat on my diet all the time. I cheat on fattening foods. I cheat on my being gluten-free. But that’s all about me. But I don’t cheat on the animals. I watch videos often to keep it fresh in my mind what they go through. When we were on vacation celebrating our first anniversary, I was reading Neal Barnard’s “Breaking the Food Seduction.” I knew that when we got home, dairy and eggs were going. Eggs were really hard for me. But I keep it in my mind what the animals go through. Whenever I see something with dairy or eggs or whatever that looks really good, I just think about the animals and nothing seems worth it. I cannot and will not be a part of their suffering any longer. But that’s my personality. 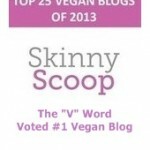 Everyone is different and going off the wagon doesn’t mean one is not meant to be vegan. It means you get back on the wagon. You think about why you went off (social situation, intense hunger, pressure, cravings, עטק) and then you plan how you will handle that situation better the next time (read the menu online and decide before you go to a restaurant and then don’t read the menu there, brings snacks with you, עטק). It’s not like addiction where if you have one drink, you are no longer sober. You don’t start from Day One again. You just do better the next meal. Not the next day; the next meal. And keep the animals in mind. I always say that if someone who wanted to eat ice cream or whatever was told, “גוט, I’ll give you the ice cream but this cow right here will have to be killed,” no one would want the ice cream anymore. That situation may not be in front of our eyes but it is true. Our choices are really life and death…for them. And you get support from friends, in life or on Facebook, and you just keep doing it until it’s your way of life and you would never imagine cheating again.